Ahh, Iceland. The land of fire and ice. Despite it’s name, it’s quite a vibrant country, with rolling green hills, blue glacier lagoons, and volcanoes that can all be seen within the same day. We hope you enjoy these pictures from Sara’s trip in October 2016! This unreal blue ice melting on Diamond beach, Jökulsárlón. I mean look at those crazy ice patterns!! No wonder they call it Diamond Beach! This picture at Hveravellir steam vents, proving why Iceland is called “the land of fire and ice”. This deep turquoise water at the secluded Aldeyjarfoss. This steel sculpture with a great view in Reykjavík. This waterfall you can walk behind (prepared to get wet on windy days like this!). This beautiful canyon somewhere in the highlands of Iceland. I wonder if they can see under all of that hair?! And these beautiful Icelandic horses. This stunningly still reflection of mountains off a lake. These beautiful autumn colors just outside of Reykjavik. Strokkur Geyser, located in the Golden Circle, erupts every 5-10 minutes! Here’s. picture of the crystal clear water taken during sunset, just before an eruption. The beautiful Fjaðrárgljúfur Canyon that will make you feel like you’re in Game of Thrones. Look at that soft, green grass! Don’t you just wanna roll in it?! These ridiculously green moss-covered volcanic rocks. This black sand beach near Vik. 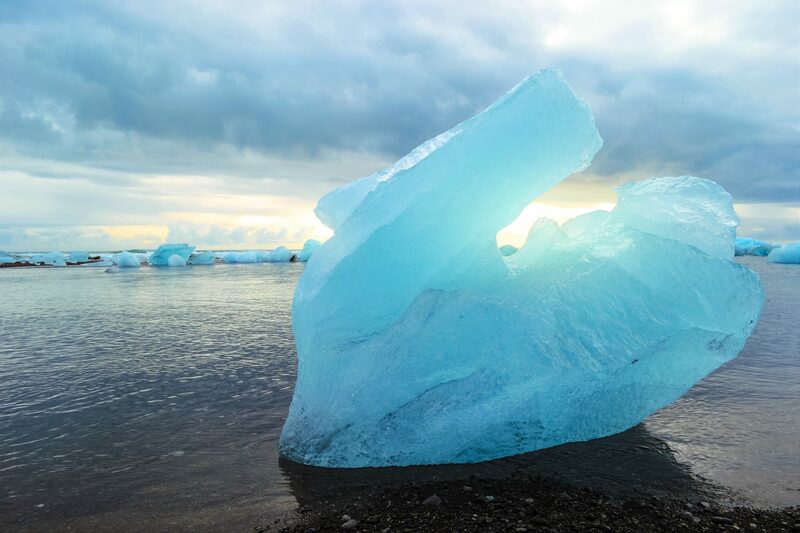 This beautiful blue ice at Jokulsarlon “Glacier Lagoon”, right across from Diamond Beach. So there you have it! 20 photos that will make you want to pack your bags for Iceland, one of our favorite countries! Have you ever been to Iceland? What’s you’re favorite country or place that you’ve explored? Leave a comment below!